The largest ski area in New Zealand’s South Island, Treble Cone is an award-winning ski field voted NZ’s best ski area for two consecutive years by the World Ski Awards. Offering 550 hectares of rideable terrain, Treble Cone is famous for its incredible views of the Southern Alps and Lake Wanaka as well as its uncrowded long groomed runs. Located less than an hour from Queenstown, the alpine resort also offers piste and off-piste trails which have become legendary and 700m of vertical to push your physical limits. 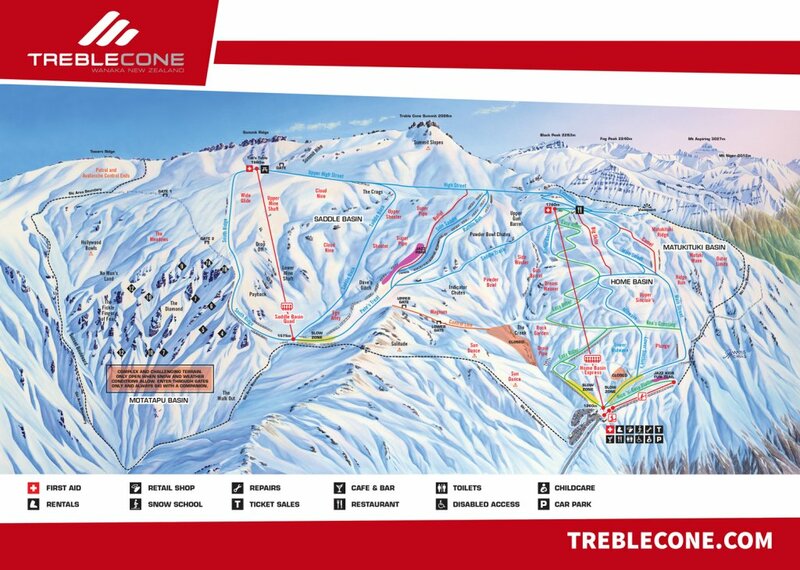 Treble Cone’s longest run is 4km and the ski field features a great mix of terrain, including 10% beginner terrain, 45% intermediate terrain and 45% advanced terrain. There are also some enjoyable terrain parks including the Jazz Park and Jazz Kid’s Fun Trail. 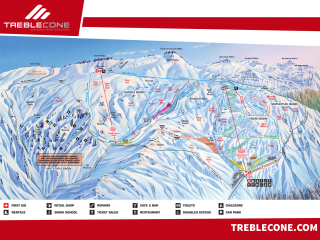 For beginners, Treble Cone offers complimentary lift access to the ‘Nice n’ Easy’ surface lifts which are located right by Base lodge. Here you’ll find all the comforts such as the ski and snowboard rental shop to get you fully kitted up as well as the café for when it’s time for a break. For those who’ve skied before, Treble Cone offers plenty for intermediate skiers and snowboarders including the Easy Rider leg burner, 4km High Street, 700m vertical and some of the longest groomed trails in New Zealand. For incredible Lake Wanaka views try Raffles Run, a wide blue groomed trail easily accessed by the Saddle Basin chairlift. If you’re feeling adventurous, get a taste of the field’s famous off-piste terrain at Saddle Back. If you’re after something more advanced the open powder face playgrounds of Saddle Basin and Summit Slopes offer fun drops and natural half pipes. If you’re truly comfortable in your abilities, the Motatapu Chutes offer one of the most unique ways to explore the backcountry while remaining with the protected and patrolled boundaries of the ski area. Regardless of your skill level, Treble Cone offers an authentic New Zealand snow experience where you won’t be able to wipe the smile off your face.